The OnePoint app is a free download from the app stores and is available on both iOS and Android based tablets. It gives business owners a centralized TV management console and serves as a remote control for DISH receivers connected to a private LAN (Local Area Network). TVs can be individually controlled or they can be grouped together to control sections of them at the same time. Every location has different needs, which makes this centralized management console especially useful in restaurants, bars, fitness centers, professional offices, waiting rooms, and any environment with a need for controlling multiple TVs at once. 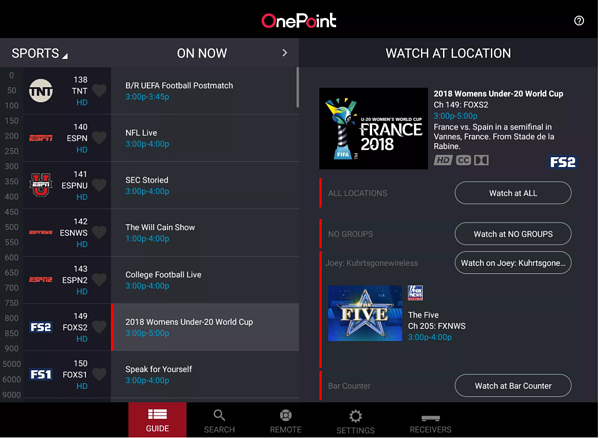 No other service solves this TV and remote juggling dilemma as efficiently as the OnePoint app. Single Interface – Control all TVs connected to the property's network via a single app, eliminating the need for multiple remotes. The OnePoint app is compatible with all generations of the Hopper (1,2,3), the Joey (1,2,3, Wireless, 4k), and the Wally receivers. The Hopper DUO will also be supported in the near future. All of the devices need to be connected to the same LAN, which may be done by Ethernet to a router or by Wi-Fi connection. Even though an Internet connection is not required for the DISH OnePoint app to work, the receivers will still need to be connected to the Internet for certain features to function. 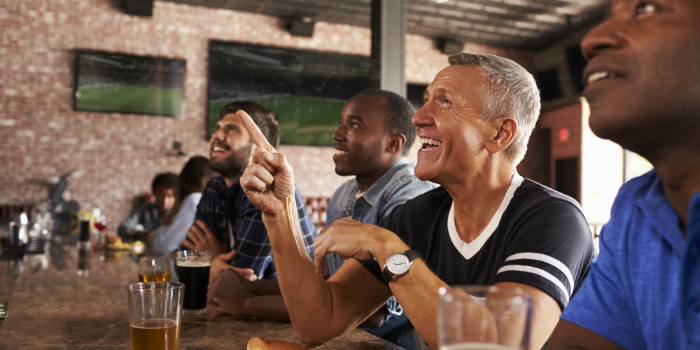 The wide variety of compatibility options give business owners several choices on how to set up their network of TVs at any given location. As far as selling the DISH TV service goes, many people only think about DISH as a residential solution. Making it a business-to-business opportunity hasn't crossed a lot of minds, even though it's been an option for quite a while. Now that the OnePoint app is available, it has made the B2B option even better. If you've thought about selling DISH before, now's the time to consider it as a service for both home and business owners. The commercial market appears to have a lot of need for the OnePoint app. Reach out to us to learn more! Photo credit for the OnePoint app preview seen above goes to DISH Network. Also, much of the content in this article has been adapted from the DISH website and press release. We thank DISH for providing information about this valuable new app for business owners.